For this weeks Bloggers Challenge we used the Circus Train layout on page 92 of the Fall Winter Collection. It was optional to create the pocket for your card, our focus was on using the squares as our layout design. 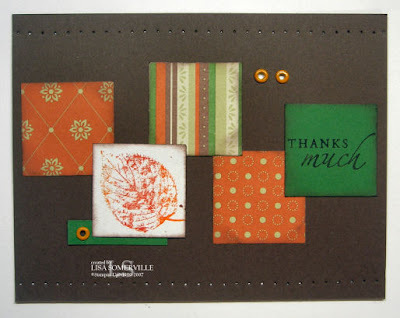 For this card, I stamped my image on confetti card stock and colored it using an aquapainter and ink pads. Then adhered it to a piece of chip board from the On Board Trimmings*. My accent squares are cut from the Dashing DSP, the sentiment is stamped in black on real red card stock. *On Board Trimmings will be available starting September 1. It’s a set of chipboard specifically for creating beautiful ornaments and/or gift tags. But, as seen on this card you can use them for embellishments for cards and scrapbook pages as well. Check out my Trim the Tree Kit Class. My friend and a fellow demo, Sheryl, and I combined thoughts and ideas and created 10 awesome ornaments. If you purchase the kit (On Board Trimmings and your choice Designer Series Paper, $40), you will get the directions and embellishments to make the 10 ornaments. Plus, you will also see other ways to use your chipboard. Email me to purchase your kit today! Don't forget to check out the blogs of the other Blog Challenge Players, you'll see just how easy it is to take a layout from the catalog and create a card. I was saying that I was impressed that you did 2 cards and that they were great examples of the sample in the catty. This makes three great minds who used the Apple Cider DSP!!! I love what you did with both cards and it really shows how versatile a layout is!!! Both are so cute! You really stayed true to the original card -- and your results are great. Both cards are beautiful Lisa! You made it look really easy! How fun! Choosing a layout for the catty and then making your own cards! Great challenge! Oh and I made a 4x4 flipbook from your tut yesterday! Was awesome! I'll post my results soon! Wow!! These both turned out wonderful!! Cute Lisa! I like them both! 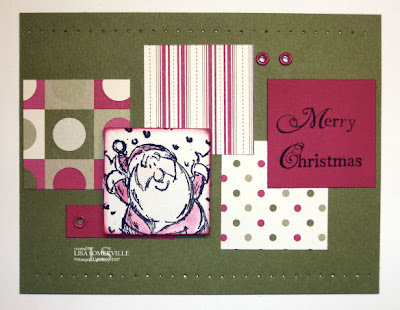 very nice Lisa - love the use of the pp on each card!! love the colors!! Love your cards--now I can case your first one since I broke down and bought that set because of you! lol! Two great cards--both much better than the original sample in the catalog in my opinion! I like the way you combined the different designer paper patterns. Great cards, Lisa, you really nailed that sketch! Lisa, Both cards are very festive & fun! I love that Santa image. While I didn't like the challenge this week I took you up on it (thanks for the prodding). Love them both Lisa, I am just a sucker for the seasonal cards. I guess it's because we don't have seasons here in So Cal. If it weren't for a calendar or the news, I'd never know what season we're in around here. Although I do have a tree in the front yard that loses all it's leaves i the winter but that's as close as we get to a fall/winter change! Love your Santa card!